My first question is how can something that grows in nature be soooo freakin expensive when I want to group them into a bouquet or arrange them nicely in a vase for a centerpiece?? I mean does it really cost $6000 to have you purchase and then arrange the flowers for me? Really? So my search for a florist has been less than satisfying. The one that everyone and I mean everyone around my town recommended literally told me that there was no way she could give me any pretty flowers for under $6000 (not including church, my church doesn't let us bring in flowers so we're talking bouquets and reception only.) When I told her I imagined half of that she told me that my guests would be disappointed with the lack of decor. I almost smacked her. Luckily I have more class than that. All I want is hydrangeas, and a few roses and orchids thrown in here and there. Nothing very fancy, trust me. I'm not even asking for out of season flowers. The picture above is exactly what I'm doing for our bouquets. So I sent her outrageous proposal to two other florists to see if they could work their magic for me and sure enough I have found one who can!! He can do just what I want and for half the cost of the original proposal. I have pictures that I took with my blackberry of the mock arrangements he made and I love them. Once I figure out how to upload the pics I will post them for everyone to see. Has anyone else had the same experience with florists? How did your flowers turn out, was it worth the money you spent? Do you wish you spend more on flowers? where are you getting married? I have a great source in Savannah. They do fabulous work and are very reasonable. wow. since my wedding is down in st. mary's, i am using a florist there. if you want to make the drive, let me know, and i will email her info. flowers are the biggest ripoff and it was horrible for that florist to tell you that. you can have nice flowers for far less than 6K. and guests disappointed? that is a bogus thing for her to tell you. completely inappropriate. Totally. Florists are way overpriced. Glad you found someone who could do what you needed at a reasonable price. I was so desperate, I ended up being my own florist. As crazy as that sounds, I bought my flowers wholesale, and mom and I made our bouquets. People loved them, though, so hey, I'll take. Word of warning on hydrangeas: They wilt fast when not in water. 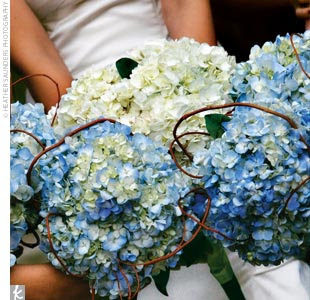 My friend had a very expensive florist (a month before my wedding) who used hydrangeas, and she was less than thrilled with the girls bouquets by the reception. But I used them, too, and they held through the ceremony, at least. Then, we used them in centerpieces, so they were in water, and I didn't use them in mine, so my bouquet lasted through photos. Yes, I agree, hydrangeas are beautiful but the first to wilt. The mini ones hold up much better so try those. I just read your tag line on your header, you are the younger version of me (if you throw in golf and tennis too)! Florists can be such a pain! I know that things in the economy are tight right now but it is wrong for them to not try and work with you and your budget at all. A really good florist will take the time and say this is what we can do with what you like for a cheaper price...or how about going with this instead of that? It is amazing how expensive flowers can be. Honestly, paying so much for flowers is the only thing that really made me sick to my stomach when it came to forking out the payments. It just seemed so silly to pay so much for something that only lasted a day! 6,000 dollars for flowers?! Was this lady out of her frickin mind?! Our bridal party was huge (I'm serious, including myself and my husband and our ushers it was 30 people) and our centerpieces we paid 2,000 and I had orchids, lilies, gardenia's...a mix of flowers. I'm glad you found someone more reasonable. I JUST finalized my venue and DJ this week! avent even gotten to flowers yet haha. But then again, I did only get engaged last month!